All life jackets must be U.S. Coast Guard approved, in serviceable condition, readily accessible, and of the appropriate size for intended user. All children under 13 years of age in all vessels under 26 feet in length must wear a U.S. Coast Guard approved wearable life jacket while underway. Underway means not at anchor, made fast to the shore, or aground. All vessels, including canoes, paddle craft, and kayaks, must be equipped with one Type I, II, III or V wearable life jacket for each person on board. A Type V life jacket is acceptable only if used in accordance with the specific instructions on the label of the device. Vessels 16 feet and longer, excluding canoes and kayaks, are required to be equipped with one Type IV throwable personal floatation device in addition to the Type I, II, III, or V life jacket required for each person on board. Inflatable life jackets are authorized only when used in accordance with requirements as presented on U.S. Coast Guard approval labels. It is unlawful for any person to operate while intoxicated*. First conviction is punishable by a fine not to exceed $2,000, confinement in jail not to exceed 180 days or both. A second conviction is punishable by a fine not to exceed $4,000, confinement not to exceed one year or both. A third conviction is punishable by a fine not to exceed $10,000, imprisonment for not more than 10 years or less than 2 years. *Operating while intoxicated means the loss of mental of physical faculties, or blood alcohol content of .08 or higher. **Failure to submit a specimen to determine blood alcohol content may result in suspension of your driver's license. 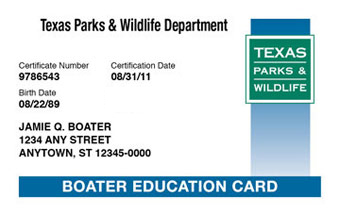 Texas Parks & Wildlife Department (TPWD) is responsible for regulating the boating and water safety laws in Texas. Trailers are registered/titled through your county tax office. Title applications and manufacturer’s statement of origin (MSO) must accompany a request for boat registration for new boats and outboard motors. Do not purchase a used boat or outboard motor without receiving a signed title and a bill of sale from the person(s) listed on the title or from their legally documented representative. If a legal representative signs the title and bill of sale for the recorded owner(s), you must obtain a copy of the documentation authorizing them to act on behalf of the owner(s). Exempted vessels – All (non-motorized) canoes, kayaks, punts, rowboats, paddle craft, or rubber rafts (regardless of length) as well as other vessels that are paddled, poled, oared, or windblown, including sailboats, that are under 14 feet in length. NOTE: Upon the sale or transfer of a titled vessel or outboard motor, the seller(s) must relinquish their interest by signing the back of the title and printing the purchaser(s) name and address. Brown colored titles (newer format for boats and motors) have spaces on the back of the title to fill in for the bill of sale information. The title must be provided to the purchaser(s). Must also be aboard USCG Documented vessels that require Texas registration. The number must be painted on, or otherwise attached to each side of the vessel, near the bow, in such position as to provide easy identification. The number shall read from left to right, be in block characters of good proportion not less than three inches in height and be of a color that contrasts with the background. The numerals must be separated from the prefix and the suffix by hyphens or equivalent spaces such as the following examples: TX 0001 GG or TX-0001-GG. The validation decal must be affixed in a line and three (3) inches towards the rear of the boat from the registration number. The number printed on the decal must match the number listed on the certificate of number card issued for the vessel described on the card. 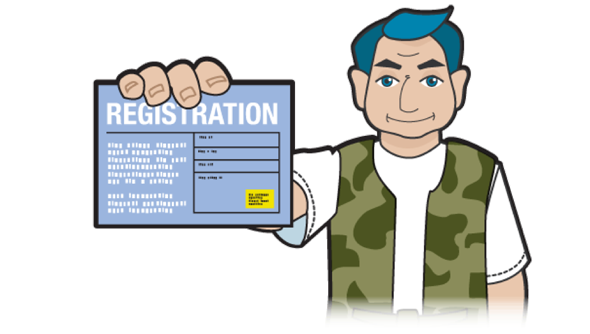 *For a complete and updated list of forms and TX state fees please visit www.tpwd.tx.us/fishboat/boat/forms. Seagrasses are plants totally adapted to living underwater. Their canopy of leaves and net of roots create a stable and protected habitat for marine life. Submerged seagrass meadows are recognized as a dominant, unique subtropical habitat in many Texas bays and estuaries. These marine plants play critical roles in the coastal environment, including nursery habitat for estuarine fisheries, a major source of organic biomass for coastal food webs, effective agents for stabilizing coastal erosion and sedimentation, and major biological agents in nutrient cycling and water quality processes. Seagrass loss in the watershed of estuarine and marine systems is caused by human activities such as dredge and fill activities, coastal development, nutrient pollution, degraded water and uprooting by propellers. Lift - Stop your vessel. Tilt your motor out of the water in order to prevent uprooting seagrasses. Drift - Plan to use the wind to drift to and through dense submerged vegetation. Pole - Pole or walk your vessel out of the shallow area or seagrass bed. Troll - Use a trolling motor to navigate the shallow waters. Even though boat access is permitted throughout many of the State’s seagrass areas, it is illegal to destroy any of the seagrass species located in the Red Fish Bay Scientific Area. In Redfish Bay State Scientific Area, 30,000 acres of dense submerged vegetation located on the mid-central coast, it is against the law to or allow anyone to uproot seagrasses with a propeller. The behavior required by the law should be practiced throughout all the coastal waters of Texas. It is the habitat that helps make the fishing great. Non-native aquatic species, plants, fish and animals are invading Texas’ waters. These pests can increase dramatically under the right conditions, displacing native species, clogging waterways, and impacting navigation and recreation. Once introduced, they are nearly impossible to eliminate. Hydrilla, Egeria Densa, water hyacinth and zebra mussels are among the nuisance species that can be accidentally transported by recreational boaters when caught in propellers, intakes or attached to hulls. Managing non-native aquatic plants that have been introduced into Texas’ waterways costs millions of dollars each year. Invasive aquatic plants can shade out beneficial native submersed plants and lower oxygen levels, resulting in fish kills; hamper the feeding of sport fish, producing stunted fish populations; negatively impact local economies; threaten human health by creating ideal mosquito breeding habitats; restrict water flow, resulting in flooding; reduce lakefront esthetics and property values; and increase the sedimentation of waterways. Non-native aquatic plants such as common salvinia, giant salvinia and alligator weed are invasive vegetation that can cause significant environmental harm. Help slow the spread of these species and prevent additional invasive aquatic species from becoming established. To curb the spread of these invasive species, boaters in Texas are required by law to remove harmful plants and animals from boats and trailers before leaving the vicinity of a lake, river, or bay. one body of water to another. Inspect and wash your boat and remove aquatic plants or animals before you leave any body of water. Use soap and/or mild bleach solutions on appropriate gear to ensure eradication of live species. Drain water from your motor, live wells and bilge while still at the body of water. Rinse with a high pressure washer if possible. Dry everything for at least 5 days, if possible. Report any infestation of non-native aquatic species to TPWD and the U.S. Fish and Wildlife Service. Anyone on or being towed by a PWC must at all times be wearing a coast guard approved life jacket, whether it's type I, II, III or V. Inflatable life jackets are not approved for use when operating, riding or being towed by a PWC. Note: Anyone being towed is considered a passenger and must be included in maximum capacity considerations. Make sure the lanyard is always securely attached to the operator, his clothing or his life jacket. PWCs may not jump the wake of another watercraft in a reckless manner within 50ft or less of any vessels. Within 50ft of shoreline on all lakes, reservoirs, and bays. PWCs may only be operated between the hours of sunrise and sunset. It is prohibited to operate a PWC outside of these hours.